I have played this one out a few times … it is only a tiny to small scenario to be played in real time … best without icons. It’s not historic, lasts 20 minutes and has 5 working AI plans. Played out a game on YouTube… under nelson1812… called it “20 Minutes to Breakfast”. Its a fun scenario you can play quickly when you have 30 minutes to kill at home. The road ahead needs to be secured. A courier on a motorcycle has reported being fired upon late yesterday. We need to ensure the track road, remains clear. One Scout has already gone ahead and has reported a small (?) enemy force. You must secure the track road. Hold the crossroads, and secure Nelsons shed (farm). 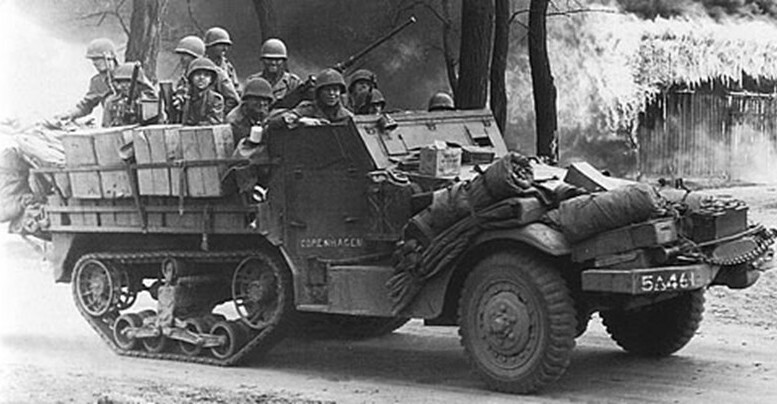 Sections 1 to 4, with half tracks, a white’s scout car and a light mortar together with various support troops. There will be 2 M5 Stuarts to give you support. Its a mixed bunch, fully rested though. Oh… sorry for the short notice, …….but your men are all we got at the moment. One Stuart, and a half track have been delayed, will arrive 10 minutes late. 2) Nelson farm will prove handy for keeping an eye on the track ahead. (gains allies 50 points). 3) Five different plays, have fun. Small game best played in real time. Played it without icons, worked well for me. 6 Comments on "20 Minutes To Breakfast [Real Time Allies vs AI]"
thank you for the scenario. Thanks Ive updated the section to reflect that. nelson1812 can you just confirm that is correct. It says you don’t need any DLC or Mods, but in fact it does. It needs not only Commonwealth Forces but also Market Garden. So I cannot play it, as I only have Commonwealth. Please update this info in the table above.